Who doesn’t love a holiday? All the family. All the friends. And the food is good too. This one won’t win any awards for creativity or originality, but it totally scores where it counts – it tastes great, feeds a crowd, and is pretty easy to pull off. And besides, other than my picky nieces, who doesn’t love a good ham? This is a recipe I came up with one year when money was a little tight and I still had to feed 10 or 12 people for Christmas. Picking up a ham anytime is a relatively inexpensive option to feed a lot of people, but at the holidays they can be a steal. As I write this in 2018, I’m planning on making this dish for Easter dinner, and I was able to score a spiral-slice ham for 95 cents per pound. Makes it a pretty sweet deal. Add another 3 bucks in glaze ingredients, and it’s a downright bargain. I have found that some of the less expensive ham options can be more salty than others. If this is true for yours, you can always boil the ham first. Stick it in a huge pot, cover with cold water, bring it up to a boil, reduce it to a simmer, let it boil for 20 or 30 minutes, then turn off the heat, let the ham sit in the water for an hour or two, pull it out, pat it dry, and proceed with this recipe. Of course, this recipe is all about the glaze. And when you get down to it, isn’t ANY ham recipe all about the glaze? A couple of tips for you: 1) make sure you use FRESH-SQUEEZED orange juice. I’ve tried it with the ready-to-drink stuff out of the refrigerator case, and you can tell. I’ve also tried using orange marmalade instead, and again, just not the fresh taste you get out of squeezing the oranges yourself. Beyond that, this is a pretty simple recipe. The only other piece of advice I can give is to make sure you don’t overcook the glaze. Because of the sugar content, it can go from ‘done’ to ‘burnt’ fairly quickly, especially if your oven is too hot. So ham it up for your next holiday meal. You’ll be glad you did. An easy-to-make entree is one key to a stress-free holiday. 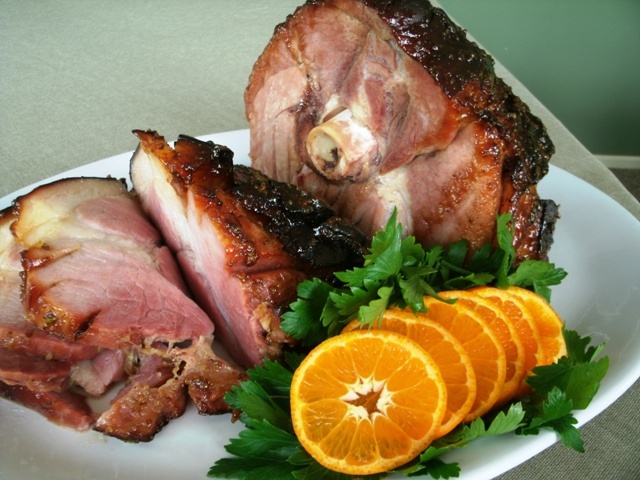 This ham recipe tastes great, feeds a crowd, and is pretty easy to pull of. A real holiday winner. In a medium saucepan over medium heat, add orange zest, orange juice, brown sugar, ground cloves, black pepper, fresh thyme, and Dijon mustard. Cook over medium heat until mixture is reduced by half, stirring occasionally. Rinse ham thoroughly and pat dry. Slice through ham skin & fat cap ¾”, creating a diamond pattern. Place ham on a wire rack, cut side down. Set wire rack in roasting pan and roast on lower rack of oven for about 2 hours (figure about 10 minutes per pound of ham). Remove roasting rack from oven. Liberally brush ham with orange Dijon glaze mixture. Return roasting pan with glazed ham to oven. Roast an additional 20-30 minutes. Let rest for 30 minutes before carving. This entry was posted in Cooking and tagged Christmas, dinner, Easter, ham, inexpensive. Bookmark the permalink. Best experience overall. Kitchen was done on time. Scott is honest, which is hard to come by & told me when an idea was bad. Best advice was the wall oven – love it the most. Everyday I say, “I love my kitchen!” I have so many cabinets & top levels are empty!